Double chin refers to the fatty tissue under the chin. It is a layer of fat around the neck that sags down, and you will look like you a have a second chin. It is very common among obese people and the elderly. Generally, people view double chins as a cosmetic problem. However, they can also cause several serious health risks if left untreated. In fact, double chin can be associated with diseases like periodontal disease and life-threatening conditions such as sleep apnea syndrome and pneumonia. 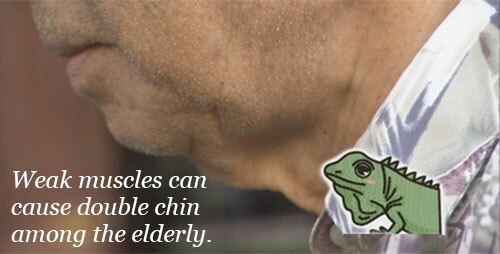 Therefore, double chin is no longer just an appearance problem, but can be dangerous to health, too. In this article, we'll let you know the two major hidden dangers of double chins and their associated health risks. The first hidden danger of double chin is the fact that it can be associated with sleep apnea syndrome. Sleep apnea is characterized by transient cessation of breathing that occurs during sleep. It increases the risk of heart disease and high blood pressure (hypertension). You'll also get increased risk of causing traffic accident during daytime due to sleepiness. Did you know that you can easily tell from people in the streets if they have double chin and are at risk of sleep apnea? Yes, you can and experts just use a simple ruler to do this! Place the ruler so it touches just the bottom of the Adam's apple and the tip of the chin. If you can't find a gap to insert one of your fingers between the neck (see photo below), then the person has double chin and is at risk of sleep apnea syndrome. The Structure of Your "Hyoid bone" Can Change Your Fate!? The second hidden danger of double chin is the type that involves the hyoid bone. The hyoid bone is a U-shaped bone located in the neck between the chin and Adam's apple and is responsible for speech, tongue movement and swallowing. It basically works like a pedestal that supports the whole tongue. Did you know that the hyoid bone is the only bone in the body that is not connected to any other bones? It is considered the only 'floating' bone in the human body and is solely connected to other bones through its muscles and ligaments. Some people have a low hanging hyoid bone, which can be hereditary. This bone structure alone can significantly change the look of your jaw, chin, and neck, including the appearance of double chin. The problem is that a low hanging hyoid bone can pose a health risk and can be considered a "dangerous double chin". How can that happen? Aging is a major factor in contributing double chin due to the weakening muscles and skin, thereby making the hyoid bone more apparent. Weak muscles can indeed lower the position of the hyoid bone making it look like a double chin. This is very different from double chin caused by obesity. Why a lowered position of the hyoid bone poses a health risk? When you swallow foods or liquids, you'll feel some movements around your thyroid. Actually, the hyoid bone is responsible for this upward and downward motion and is essential for proper swallowing. Both swallowing and eating is a highly complex mechanism. Swallowing involves the process of making foods or drinks pass from the mouth, to the pharynx, then into the esophagus. The hyoid bone plays a vital role in this process as it helps prevent the food from going to the windpipe (trachea). A lowered hyoid bone can cause this process to fail and may make the foods go to the windpipe instead. This is colloquially referred to as foods "going down to the wrong pipe". Foreign materials like food and liquid going to the windpipe or airways leading to the lungs can cause lung inflammation, which is medically called "pulmonary aspiration". This is very dangerous and can cause choking or death within minutes, including increased risk of pneumonia. In addition, a dislocated or lowered hyoid bone can worsen the movement of the tongue by not enabling it to stick to the upper jaw. The tendency is that the tongue will easily accumulate dirt or bacteria. This can contribute to bad breath and gum diseases. To determine if your double chin is caused by hyoid bone degradation and if you are at risk of pulmonary aspiration, you may perform these simple tests. NOTE: These procedures many not check exactly if you have other swallowing impairments or medical conditions. Place your index finger on top of your "Adam's apple". Drink water or swallow your saliva. If you feel your Adam's apple go up above your index finger, then your swallowing mechanism will appear to be working as it should! Swallow your saliva a couple of times for 30 seconds. If you are able to swallow your saliva only once or twice during the 30-second time frame, then you may have a "swallowing disorder". Below are two exercises that you can perform to strengthen your neck muscles and help it lift the hyoid bone. Keep your mouth wide open for 10 seconds. Repeat this for 5 times, twice a day. Lie on your back and slowly raise your head until you can see your toes. Stay in this position for 10 seconds then rest for another 10 seconds. Repeat this process 3 times, thrice a day.